Search carefully for overhead power lines, poles, and guy wires. Conditions can easily change, so check the site frequently. Look for lines that may be blocked from view by trees or buildings. If you suspect hidden power lines, talk to the utility company, inspectors, and experienced colleagues about your concerns. To learn the location of underground utilities, call Underground Service Alert (USA) by dialing 811. Alert others about lines at your pre-job briefing. Make sure everyone at the job site knows about nearby overhead and underground utilities and where they are located. Whether they are operating heavy equipment, using handheld tools, or climbing ladders, all workers on site must be aware of power lines. 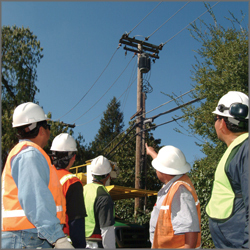 This includes overhead and underground lines, and the service drops that run from utility poles to buildings. Before any work begins, make time to examine the work site carefully for overhead utilities.